Hypoglycemia is commonly linked to diabetes. This refers to lower than normal blood sugar levels. However, you can experience hypoglycemia without having diabetes, in which case it's called nondiabetic hypoglycemia. Balancing blood sugar is crucial regardless of whether you have diabetes, since glucose plays a major role in fueling your body. Caffeine, which is commonly consumed in a wide variety of beverages and other forms, can disrupt your natural blood glucose balance. Because glucose is a crucial fuel source for your organs and cells, your body works hard to keep its blood glucose level within a narrow range. When blood sugar falls below this normal range, it's called hypoglycemia. A number of circumstances can cause hypoglycemia, such as not eating for long periods of time, strenuous exercise, certain medications, poor diet and inherent abnormalities in glucose regulation. Symptoms of hypoglycemia include fatigue, headache, mood changes, heart palpitations and excessive sweating. Hypoglycemia is a common side effect of caffeine, according to Drugs.com. However, the mechanism responsible is poorly understood. Researchers found that caffeine impairs glucose sensitivity in a dose-dependent manner, starting at a very low dose, according to a study found in the February 2013 issue of "Applied Physiology, Nutrition and Metabolism." In the study, caffeine caused impaired glucose metabolism in healthy men and women. This data suggests that those with diabetes are not the only ones at risk for this side effect. Hypoglycemia occurs when your blood sugar falls below 70 milligrams per deciliter. If you experience symptoms of hypoglycemia, you can bring your blood sugar back up by eating 15 to 20 grams of simple carbohydrates, according to the American Diabetes Association. Examples include 2 tablespoons of raisins, 8 ounces of nonfat milk, 4 ounces of juice or 1 tablespoon of honey. If you have diabetes, you can check your blood sugar using a blood glucose meter to find out whether it's back within the goal range your doctor set for you. If you have issues with hypoglycemia, ask your doctor whether you need to limit or avoid caffeine. The lowest dose of caffeine necessary to disrupt blood glucose regulation was less than 1 milligram per kilogram of body weight, according to the "Applied Physiology, Nutrition and Metabolism" study. For a 130-pound adult, this may be as little as 25 to 50 milligrams of caffeine. 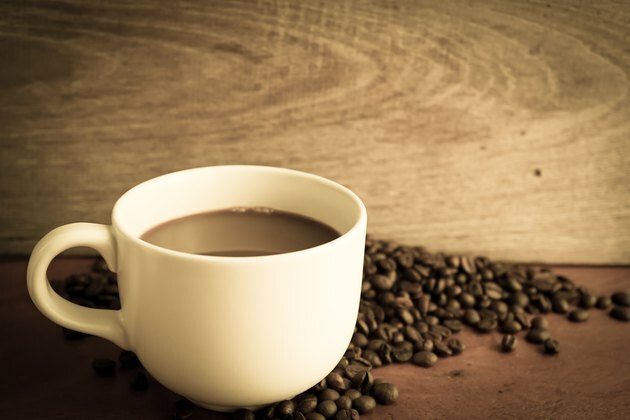 The average 8-ounce cup of coffee contains about 95 milligrams of caffeine. Caffeine may trigger or aggravate existing hypoglycemia issues and make you feel worse.